An apple day is when from noon one day to noon the following day, you consume nothing else but up to 6 apples. Even liquids/water they would reduce and only drink liquids if they felt thirsty. Does It Matter What Size of Apple I Eat? Dr. Simeons said it didn’t matter. Now in truth, I think we can all logically know that the amount of calories and carbs in a large vs small apple is going to be quite different. Most of us are like, if I can have 6 apples and it doesn’t matter what size, I’m getting 6 of the BIGGEST possible! I have TOTALLY thought that way before. Remember an apple day isn’t for the purpose of cheating but subconsciously we are sometimes geared towards that type of thinking right? Here below you can see the difference between a large apple and a small apple in calories and carbs. There’s about 10 more carbs per apple in a large vs. small. Times 6. That’s about 60 more carbs. Is this the end of the world? No. You can certainly eat 6 large apples if you want. But you may not actually NEED to. And it might be worth eating apples more based on what you need vs. what you want. Am I Supposed to Eat The Full 6 Apples? Can I Eat Just 3? Why you prudent little hCGer. Being all responsible and stuff. #IwanttobelikeyouwhenIgrowup #doyousellyourselfcontrol? Yes of COURSE you can eat 3 apples. Dr. S said up to 6. So you can gauge your hunger and needs and eat just what seems appropriate that day. If you’re starving and intent on doing your apple day, you may want to eat more though. If My Apple Day Ends At Noon, Do I Eat Apples All Morning and Eat Regular VLCD the Rest of the Day? HELP. Oh you mean “Apple Morning”? You didn’t know that was a term? Gotcha! It’s not. I just made that up, literally like this second. Let’s refer to “Apple Morning” as the portion of the Apple “Day” that occurs the following morning until noon. A common question is since the apple day is supposed to begin at noon and end at noon the following day- what do you do on that following day? The day when the apple day is technically “still happening” until noon? Like, do you eat 3 apples in the morning on that next day as part of your apple day still and then start your VLCD day AS WELL at noon and have your lunch of 100 grams of protein and veggie and one P2 fruit serving? I don’t think there’s any straight and narrow rule, Dr. Simeons didn’t clarify this to my knowledge, but I’ll just share what seems reasonable and what most hCGers do. It seems like most people when doing an apple day, eat their apples all in one day by itself, meaning by the following morning, they aren’t eating any more apples, but rather just having a regular ‘ol vlcd day with their coffee and stevia for breakfast. Alternately, if you ate 4 or 5 apples on your main day that’s your “Apple Day” and then the next morning eat 1 apple for breakfast and then begin your regular VLCD at lunch, I don’t see this as being totally unreasonable either do you? So that’s another option. Day after main apple day (apple morning): Eat 3 HUMONGO apples for breakfast, then VLCD for lunch and diner (which involves 2 more apples ;0)- while you COULD do this, this option just doesn’t seem as “in line” with the whole thing we’re going for on the protocol to me so if it were me, this is probably what I wouldn’t do. But again, there’s no actual RULE here. 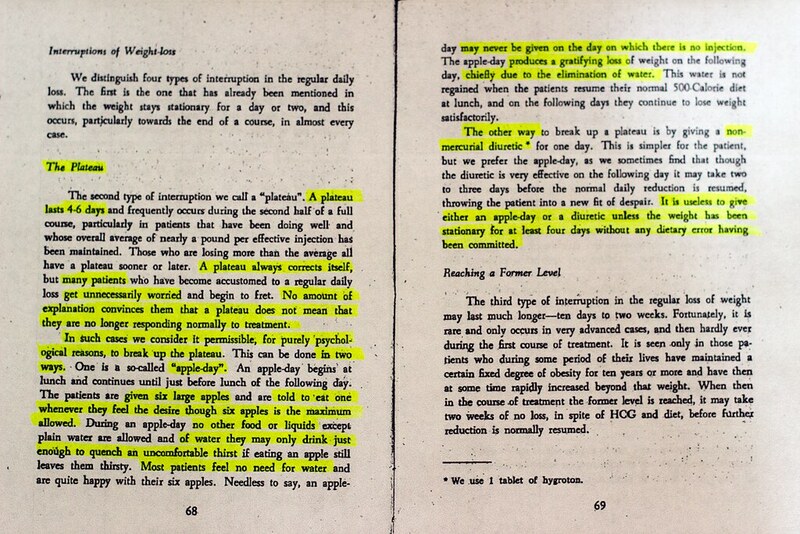 What is the main purpose of an Apple day according to Dr. Simeons? 2. As more a mental-balance measure to make up for the frustration and discouragement a person might be feeling over the scale seeming to be stuck for a period of time. When Are You Technically Allowed to Do an Apple Day? According to Dr. S, the apple day was really only meant to be used when a person’s weight had been stuck for at least 4 days and was in lieu of something like a laxative. He specifically noted that an apple day should never be done a day you skip your dose, as in when you are on your period or when you skip a dose once a week when you are doing a longer 40ish day round. The second type of interruption we call a “plateau”. A plateau lasts 4-6 days and frequently occurs during the second half of a full course, particularly in patients that have been doing well and whose overall average of nearly a pound per effective injection has been maintained. Those who are losing more than the average all have a plateau sooner or later. A plateau always corrects, itself, but many patients who have become accustomed to a regular daily loss get unnecessarily worried and begin to bet. No amount of explanation convinces them that a plateau does not mean that they are no longer responding normally to treatment. In such cases we consider it permissible, for purely psychological reasons, to break up the plateau. This can be done in two ways. One is a so-called “apple day”. An apple-day begins at lunch and continues until just before lunch of the following day. The patients are given six large apples and are told to eat one whenever they feel the desire though six apples is the maximum allowed. During an apple-day no other food or liquids except plain water are allowed and of water they may only drink just enough to quench an uncomfortable thirst if eating an apple still leaves them thirsty. Most patients feel no need for water and are quite happy with their six apples. Needless to say, an apple- day may never be given on the day on which there is no injection. The apple-day produces a gratifying loss of weight on the following day, chiefly due to the elimination of water. This water is not regained when the patients resume their normal 500- Calorie diet at lunch, and on the following days they continue to lose weight satisfactorily. The other way to break up a plateau is by giving a non- mercurial diuretic for one day. This is simpler for the patient but we prefer the apple-day as we sometimes find that though the diuretic is very effective on the following day it may take two to three days before the normal daily reduction is resumed, throwing the patient into a new fit of despair. It is useless to give either an apple-day or a diuretic unless the weight has been stationary for at least 4 days without any dietary error having been committed. In the next article we’ll talk about a much hotter topic – are apple days good for stalls and cheats? Stay tuned for next week! I’m enjoying reading all your materials and find them very helpful. I just began P3 and within a few days went up 4 lbs! I lost 15 on 40 days of P2 and then 2 more on the 72 hrs following last injection, going to stay at the-17.. but re-gained right away. I have added small amounts of fats, avocado, salmon, turkey bacon and olive oil, and larger portions.. maybe 400 calories more a day during this 1st week. I have not cheated, no sugar or starches.. same moderate exercise 4- 5 days a week . It’s a big disappointment to see that scale jump. Do I have to do an apple or steak day or yogurt day? Curious what your thoughts are on Bare baked apple chips. There are no other ingredients, just baked apples. I can’t imagine it would be any different on an apple day (or regular p2 day for that matter) but was super curious what your thoughts might be. Thanks! Great site, great info. Keep it up! If it has no other ingredients but apple, should be fine! You just have to watch out for the amount you eat since baked ones should look less though it could already be 1 whole apple. I’m on day 19 of P2 and have lost a total of 14 pounds. I am having a difficult time drinking water. I can barely get 2 liters in a day, do you think that this is causing the slow weight loss? Also most importantly, I am taking an 8 hour road trip on day 23. Can I do an apple day so that I do not have to worry about liquids and trying to take food on the road, it seems a little simpler? Will the apple day hurt me if I am not stalled? I did an apple day once when I didn’t need to and nothing bad happened, I just didn’t lose weight that day, but I didn’t gain either. I myself feel apple days are best for when there’s really a stall as it’s kind of a lot of sugar and carbs and no protein which just seems counterintuitive to me. But like you said I can understand when on a road trip it’s hard- you could still do a regular vlcd day and just drink less water that day as well. But you could certainly try the apple day too. If I do 40 days I need to have one day break every week? Hey there Vi! Yes if you do 6 weeks you take 1 skip injection day a week but continue the diet. You will likely need more than 21 days- the weight loss will greatly slow soon because you are so close to goal and the reason for larger weight loss in the first week and a half is because of excess water weight- real fat loss takes much longer – usually about 1/3 lb of fat per day on average can be expected. I just want to say Thanks for this great site and all you do!! I’m trying to loose 40 pounds! I just started hcg injections 5 days ago.. I’ve lost 8.8 pounds so far!! I’m actually shocked I’ve lost this much! I keep up with my calories on an app called “losing it” which really helps me stay on track. I’m nervous about when I go to phase 3 we are going to Europe and I’m sure there will be plenty of tempting foods. Any advice? And how long after phase 3 can I start up again with shots? Help! I’m in phase two on day 18. I have only lost ten pounds and I’m at another stall. I have done Hcg before six years ago and was super successful. Now I’m post partum 7 months and having a struggle. I noticed my dose was too high 250 units for I jutst changed to 150. Can this be the reason I’m not losing properly? Please i need support! I follow the diet religiously and this is nerve racking. I am sorry you are currently struggling with the diet. Can I ask you a few questions to help troubleshoot? – What’s your current height and weight, and how much would you say you currently have left to lose? – There’s so many variations to the protocol these days, we like to ask which specific one you are following – is it the 500 cals? or the 800 cals? – You mentioned starting at 250ius and then going down to 150. What other dosages have you tried? Sometimes it can be easy to bypass your best dosage – sometimes it’s just a small 5-15iu difference – I know that sounds crazy but I’m not the first to notice this. – How did you feel when you went down to 150ius? Did you have any hunger issues? So I have a little confusion regarding the next day. The protocol says you start with an apple at noon, then eat up to six apples until noon the next day. After you eat your last apple (noon the next day), do you eat for the rest of that day? And if you do, what do you eat, how many calories, etc…? What kind of apples and what size should I eat in this diet? I mean, I have been eating big Granny Smith apples but now I have some small red apples. Obviously the calories varied. So, if I want to make an apple day, what kind of appme should I eat? What size? I am on the 4th day of Phase 2 and the first two days I lost 3.5 lbs!! The last two days I have remained stable but that means I am still ahead 3 days of weight loss (as a woman!). I also lost 0.2 lbs on my loading days eating 1900 cals/day. My question is should I wait to do an apple day until I have missed 4-6 days of weight loss after I catch up to the place I should be?? Thank you for all of the work you have done on this site, it is amazing!! Yes, you should wait a few days before doing an Apple day. You can also remove the fruits/melba add more vegetables and see if that helps your weight loss. I understand you’re supposed to start the apple day at lunchtime, and limit the amount of water you drink during apple day. What about before lunchtime, are you supposed to drink tea and water that morning as usual? Or limit your fluid intake still before lunchtime? I think you are not supposed to drink any other liquid except water even in the morning of an apple day. I know this is super difficult but as someone on P3Day20 I can assure you the apple day is NOT required. Yes you will lose the next day but you will also catch up in weight loss if you don’t do an apple day. I always freak out around my TOM because I stall or worse yet gain but it always comes back off and apple days are miserable. Growling tummy and headaches. I have learned patience and acceptance are key to this diet including when I have bad cheats. And I have had doozies. I’m down 50lbs so far and will lose my additional 50 just through following the plan and not doing the stinking apple days. BTW I also have not done a steak day in P3. The diet is strict enough and our bodies will readjust so why go through more extreme measures that are really just for psychological comforts. Hi! I’m 10 days away from P3 and I’m freaking out! LoL! I just don’t want to gain some of the weight I lost. Did you experience any gain in P3? Hey, I’m using the hcg spray.. is it as effective as the injections,,? In a doctors recent study she says that blood hcg levels are raised only by injections. My injections cost only 10.00 and my dr. Puts me on a 28 day plan w a modified calorie intake of 800 or 900 because i have hashimotoes thyroid. I still lose 15 pounds and also have had some cheating. I did clean loading and lots of fats this round and its made a huge difference! Does the apple day allow for some f the apples to be cooked? Can some of the apples be cooked? I have stalled for more than 4 days, but don’t want to do an apple day. I am not eliminating, but afraid a laxative might irritate my colon. Very sure a lot of my weight is in my gut right now, it just makes sense. As long as I am eating right, and feel good. Is this is okay, do you think? let me thank you for all the practical, and emotional support your journey has given me. I would not be losing weight at all if not for you. I use a oxygen bowel cleansing capsule i take one pm and one am it is not a laxitive but oxygenates the bowel to help it not stick around. You do not want stuff sitting around in there decaying as your body will absorb the toxins. I am on p2 13 days and only lost 7lbs. I have 35lbs to lose in all and have never lost 2lbs in one day. I have been following protocol to the T except drinking a gallon of water a day. I simply can’t do that. I am not typically a thirsty person so drinking that much water makes me sick. I do try to drink at least 60-64 ounces a day. Do you think I am on track or this is not working for me? I realize that being on a vlc diet alone has probably made me lose the weight I have. I just can’t see that this is really working for me and getting aggravated. I haven’t lost anything in 3 days, should I do the apple day? Any comments is truly appreciated. Ty. When I have difficulty losing the weight that you are describing I will stick to fish and a tiny bit if chicken. It is lighter protein. Also, switching vegetables might be helpful. When I ate steamed spinach I would lose twice as much weight. Hope that helps! Ok so I didn’t read the directions before doing my first apple day because this is my second time doing HCG… I thought I already knew all the rules but apparently I don’t. I started eating apples this morning because I didn’t want my stomach growling while I was in my college classes, I’ve had my black cup of coffee and almost 40 oz of water all before noon. I’ve eaten three apples today so far and now I’m freaking out because Idk if any of that truly matters and I’m not sure how to correct this! I have not cheated! By the 5th day I had lost 4lbs., and now by day 6 I have gained 2 of them back?? Why am I gaining when I haven’t cheated? 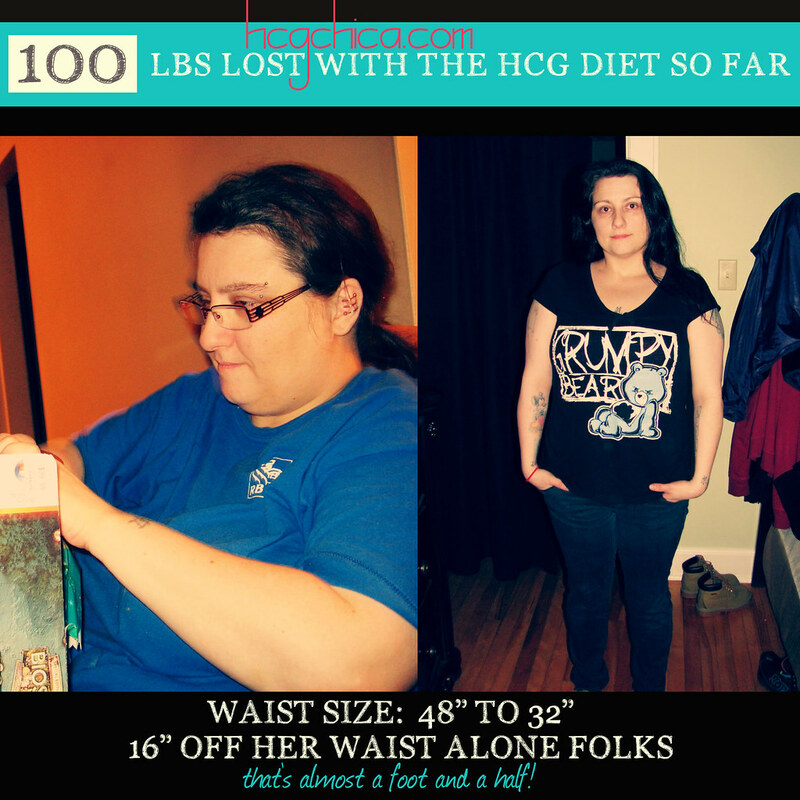 Good afternoon – I am on Day 20 of my first round of HCG. I’m doing pretty well each day, have a couple of days where I didn’t plan well or was away at a conference and couldn’t weigh my food and/or had limited healthy options! UGH. Anyway – the last couple of days have me frustrated on the scale..purely because of crazy ups/downs. Three days ago I was 208.6. 2 days ago I was 209.8. Yesterday I was 206.8…. today… 210.4. If I were cheating I would say it… I may be approaching my cycle, but these swings are just crazy! I’ve lost 12lbs so far.. but admittedly am getting frustrated with the big swings. Should I do an apple day? Love your site… you look AMAZING! 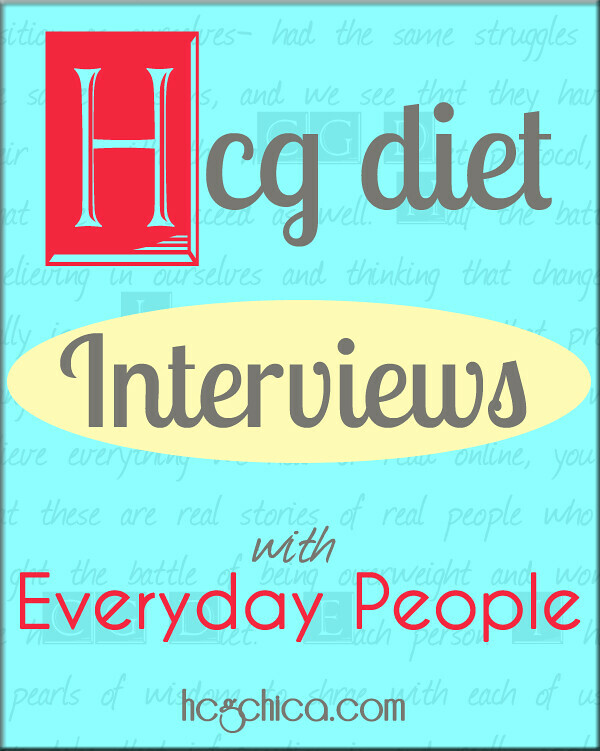 Hi @Logan Hadaway – getting sick on hCG often stalls weight loss. I see this all the time. I think it’s when the body is fighting infection it can worry about losing weight or something. Sorry to hear it! I hope things are bit better for you this week. Ola Chica! Thank you so much for the encouraging reply! I really love that I stumbled upon your website, you are wonderful. I am 4 days closer to Maintenance Phase and have not reached my goal and am a little nervous. 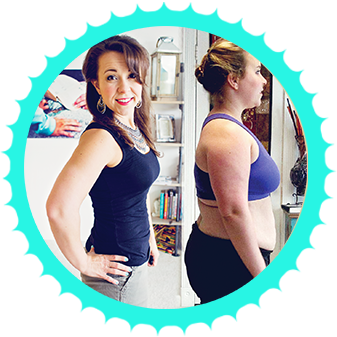 I know I have the tools to maintain the weight loss; but have you actually lost weight during Phase 3? Again, thank you for everything you do here – – what a wonderful thing you are doing here, I am sure everybody in your “tribe” is equally thankful for all that you do to keep us informed and on track. You are an Angel! Love your site…found you on Niche Pursuits…did you do the design? Hey +Scott masse – yes I actually did do the design- or 90% of it anyway- I basically spent months scouring newer looking website designs and studying what I like about them, what made them look cool etc, then I hired a “design mentor” on odesk who knew a little more about web design to help me a bit when I got stuck, but I would say I designed the majority of it myself. This was after hiring a web design company for several thousand dollars that seriously underdelivered and not only did I hate the designs they came up with, they completely oversimplified the needs of my site which was upsetting because I tried to be very clear about the needs of my site being that i Have so much content and needed a lot of organization and hierarchy capabilities- they just completely ignored this I feel so that’s when I realized if I wanted this done right I would have to do it myself. How did you find me on Niche Pursuits? On a comment or something?